If you have been undertaking or are thinking of doing Pay-Per-Click Advertising you will have probably figured that your Ad Copy plays a vital role in the success of your PPC campaign. If you have already been doing some work you will have realised that even with the best keywords and a very compelling landing page your PPC campaign may still fail to attract the business you seek. Copywriting could be the culprit! It’s not unusual for us to forget that no matter how technical the whole PPC gets with Quality Score, Campaign Optimization etc. A complicated Ad Copy is worse than no copywriting at all! Copywriting should be kept plain and simple, because you want to target people based on what they search. Nobody is going to be searching for complicated terms such as: picture box, they will look for TV’s. 1. Be Specific: Don’t write a generic Ad copy for all your keywords. You should try to be as specific as possible, so that your Ad can deliver the right message to your customers. For example, if you are selling shoes and you have different types of shoes in your inventory – e.g. Men’s shoes, Women’s shoes, Tennis Shoes, Walking shoes etc. ; you should separate them into the different types of inventory that you have and then write compelling ads for each of those set. The best way to do this is to have multiple Ad groups for your different set of keywords so that you can easily identify each group. 2. Highlight your Unique Selling Points (USP): How different are you from your competitor? What makes your product or service unique? What benefits would the customer gain from purchasing your products instead? – This is your USP. In the examples above the USP’s are pretty straight forward. By reading them you know exactly what each company proposes to do and what their selling points are. So when you are copywriting, you must include your USP that differentiates you from your competitor. A potential customer will want to know why they should buy from you, your copywriting must answer that question. Some examples of USP include free shipping, 24/7 support, money back guarantee, excellence awards or anything else that can help you to boost your initial credibility and trust. These should all be included it in your Ad copy. 3. 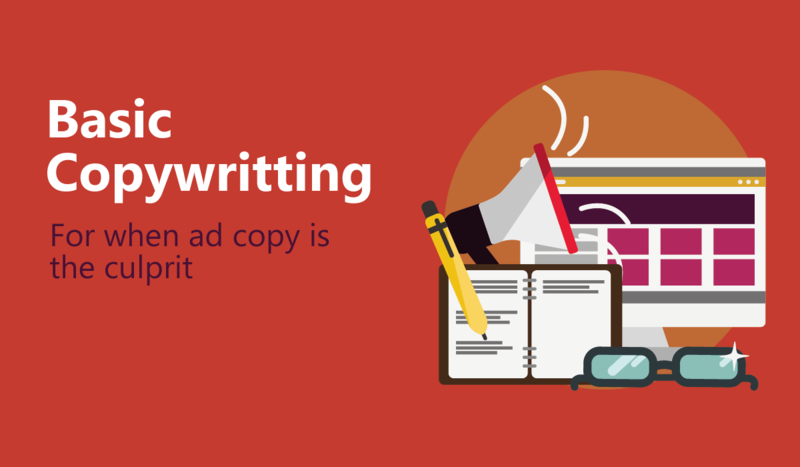 Don’t forget your keywords: Advertisers often try to make their Ad copies very creative. But sadly very few of them do well in terms of CTR and conversion. Creativity is good and is essential for writing any sort of advert. But when it comes to PPC, sometimes too much creativity can hurt you. Because of the nature of PPC, it’s very important for you to grab the potential customers attention right at the beginning. copywriting doesn’t include the words that he is searching for. Think of it this way, when you look for something online you are provided with 10 results, you naturally go with the results which have the exact same words of your search query on them. Google by default automatically bolds your searched keywords in the Search Engine Results Page (SERP). So when writing your next Ad copy, make sure to include your main keywords in your Ad Headline and Ad Description so that they are automatically bolded when the potential customer includes those keyword in their search query. Having your keyword in the Ad copy also makes your ad more relevant therefore giving you a better CTR and a better quality score. 4. Include A Call to Action: Many advertisers forget to include a call to action in their Ads. Having a good call to action can increase your CTR and also increase your campaigns effectiveness. A potential customer needs to know what’s in it for them if they click on the advertisement. It has also been proved that people generally like to be directed with what to do. For instance if someone is thinking of getting pet insurance they need to be presented with a destination where straight away they can register their pet and get an instant quote. The first ad is from moneysupermarket.com. Their call to action is very loud and clear, if you click on the ad, you will get a quote instantly as well as saving money! It sounds convincing right? Because the main key words are instant and price. Anyone that clicks on that ad knows that they will get an instant quote and save money before they even have to click. So what are some of the good call to actions? Well, there is no golden rule. You really need to test and see what works for you. But before that you really need to understand your own business model. Why would anyone come to your website? Where are those visitors coming from and where are they going? 5. 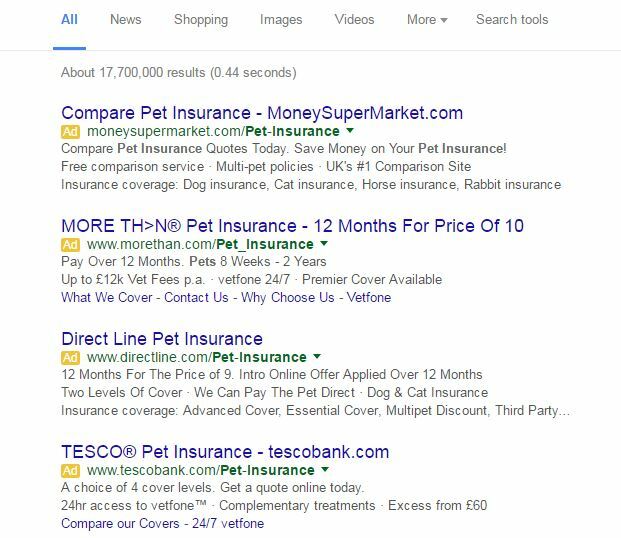 Stand Out from your Competitors: Just because your competitor is doing well with a particular PPC campaign and its having great success the worst thing you can do is copying their ad copy. You can certainly take ideas from your competitors while you are writing your ad copy. But blatantly copying their ad ‘word by word’ makes your ad insignificant and might also land you in trouble. 6. Get Right to the Point: Leave the Mumbo-Jumbo out! You don’t have the luxury of a lot of space to write your PPC Advertisement. Google Adwords only allows 25 characters in the title and 35 characters in the description of each product. So avoid all the unnecessary words and include things that add value to your advertisement. You will get only about 5-10 seconds before the searcher moves away to a different page, so you really need to grab his attention the first time he sees your Ad. It is always good to tailor your offers. For instance, if someone is looking for “Cheap Hotels”, you might want to highlight the price factor in your copywriting. On the other hand if they are looking for “luxury hotels”, you might want to highlight some of your premium facilities, e.g. swimming pool, spa etc. So think of some offers and specific details that you can give away right within your ad copy which will save the customer their time and your money. 7. Ad Formatting is Important : Make sure your ad is formatted properly with correct casing and spelling. I run across hundreds of ads in a day which look horrible because they aren’t properly formatted. Examples include titles not properly cased, the entire text is written in small letters and the worst of the worst, spelling mistakes! You only get a very small window of opportunity when it comes grabbing the attention of your customer via PPC so make sure that they get a good first impression by looking at your copywriting. 8. Your Display URL is a part of your Ad Copy. Use It wisely. Many advertisers don’t pay any attention to their display URL. But display URL does play a huge role in your Ad’s effectiveness and CTR. You can put absolutely anything in your display URL, provided that the domain matches with the domain of the destination URL. 9. Test…Test & Test: The entire success of your campaign depends on how far can you test and implement the change that brings you a positive ROI. Testing is absolutely essential and should not be ignored regardless of how good your campaign is currently performing. Now the question is, what should you test? Well there are lots of things that you should test, but unfortunately testing itself is a very huge area that I can’t cover in this post. But I have briefly summarized a couple of points below that should help you to get started with testing and perhaps sometime later, I’ll try to write a dedicated post on some of the best PPC ad testing methods. Test your Ad Headline. Create few variation of the headline and see which brings you more CTR and more conversation. Don’t get fooled by high CTR – high CTR does not necessarily mean that your ad is performing well. Rate of conversation also needs to be taken into account. Test different offers. Each one of your ads might include an offer and you might want to create other offers to see which one works the best. For example does an offer of “20% off” perform better than “£50 discount” etc. Test your Unique Selling Points. Sometimes even after you have identified a unique strength of your product or service, it may not be the best converting one. So always test with different selling points and see which one works for you. Run multiple split tests of your ads. Have at least 2 ads set up in each ad group and run it for a considerable amount of time before coming to a conclusion about their performance. Make small changes at a time. For instance, start with your headline first. When you are changing the headline, don’t make any other changes. Run that test for a while and find out the best headline that gives you a good CTR. Once you achieve an acceptable result, move to the next item and test it thoroughly. Continue this tests until you have covered all your bases. CTR is an important indicator for your Ad’s effectiveness because CTR is directly related to your ad copy whereas conversion is only partially related. Even the slightest of changes matter. You might not find all tests worth doing, but you should know that even a single punctuation mark can make a significant difference on your CTR. Correlation between your ad copy and your landing page: On most of the cases your landing page will be prepared first, before you get on to write your ad copy. But sometimes advertisers tend to forget what is offered on their landing page and writes their Ad copy totally from their imagination and creative mind. Therefore even a good ad copy with high CTR often fails miserably because after a customer goes to the landing page, they can’t just find what the ad copy has promised. Make sure that you have some sort of correlation between your landing page copy and your copywriting. One easy way of doing this is to highlight and include your USPs and benefits in your landing page that relates to the promise that you made in your copywriting.